ebook containing all the articles in this series - https://docs.google.com/file/d/0ByVemcKfGLucNUV6UVlCQ1BrVUU/edit?usp=sharing. sAsthram establishes that un-interrupted kainkaryam (service) to bhagavAn is the ultimate goal for a jIvAthmA. But when it comes to the means to attain that kainkarya prApthi, there are various paths defined. bhakthi and prapathi are considered as the most important means to attain the kainkarya prApthi. But even beyond bhakthi and prapathi, total dependence on AchAryan is considered as the ultimate and easiest path to get the ultimate benediction. Simple translation: An AchArya is one who understands the sAsthram fully, establishes the principles as given in the sAsthram and he himself practices the same. It is also explained by our pUrvAchAryas based on sAsthram that, an AchArya must be totally faithful to srIman nArAyaNa and fully accept his supremacy. An AchArya must be purely situated in gyAnam (knowledge), bhakthi (loving devotion) and vairAgyam (detachment) and must be abstaining from upAyAntharams (any other means other than srIman nArAyaNan), upEyAntharams (any other goal other than service to srIman nArAyaNan and his devotees) and dhEvathAntharams (having any attachment to other dhEvathas). All our pUrvAchAryas were shining examples for such qualities in them. 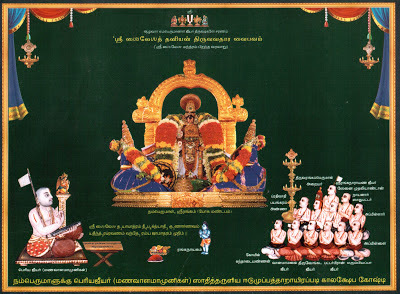 piLLai lOkAchAryar brings out the essence of sAsthram as taught by the pUrvAchAryas in srIvachana bhUshaNa dhivya sAsthram. Here, he finally establishes that "AchArya abhimAnamE uththArakam", meaning AchArya's mercy towards the sishya is the ultimate path for the sishya to achieve the ultimate benediction of kainkarya prApthi. This principle is beautifully explained with many examples by paravasthu pattarpirAn jIyar (one of the prime disciples of maNavALa mAmunigaL) in his divine grantham named "anthima upAya nishtai". anthima = ultimate/end, upAya = path and nishtai = firm faith/dependence. This means "total dependence on AchAryan (the ultimate path)". paravasthu pattarpirAn jIyar himself says that, this whole grantham is based on mAmunigaL's direct instructions and he is just like pen/palm leaf which are used to document his AchAryan's words. This is very similar to nampiLLai's eedu which was lectured by nampiLLai himself but documented by vadakku thiruvIdhi piLLai. So, these are to be considered as mAmunigaL's direct instructions according to the author. This AchArya nishtai was specifically manifested in the likes of madhurakavi AzhwAr towards nammAzhwAr, ANdAL towards periyAzhwAr, dheivavAri ANdAn towards ALavandhAr, vaduka nambi towards emperumAnAr, etc., to name a few. This nishtai is also called as charama parva nishtai (ultimate level in faith). While total dependence on bhagavAn is called as prathama parva nishtai (initial level in faith), the same on AchAryan is called charama parva nishtai. Our AzhwArs and AchAryas have given many valuable instructions on charama parva nishtai in their many dhivya prabhandhams and srI sUkthis. This grantham is in maNipravALa style (a mixture of tamizh and samskritha words) and as in many other pUrvAchArya granthams, has long sentences, phrases that are difficult to translate directly, etc. adiyen will attempt to present the essence of each section/paragraph as close as possible to the original text. Very special co-incidence - By the divine will of emperumAn this translation effort went into 18 articles similar to bhagavadh gIthai's 18 chapters. In the 18th chapter emperumAn reveals the glories of surrender, here also in the last article, glories of surrender to AchArya is revealed. Even more special is that this series is concluding in time for ALavandhAr's annual thirunakshathram day. ALavandhAr was fully situated in AchArya nishtai and revealed his divine emotions towards nAthamunigaL in his sthOthra rathanam - its an apt day for us to remember and relish this divine grantham "anthimOpAya nishtai". adiyen is very thankful to many srivaishnavas who encouraged me and continues to encourage me in writing such articles. With the blessings of such srivaishnavas, our pUrvAchAryas, AzhwArs and sri-bhUmi-nILa samEtha emperumAn, adiyen is presenting this book to the larger srivaishnava community. 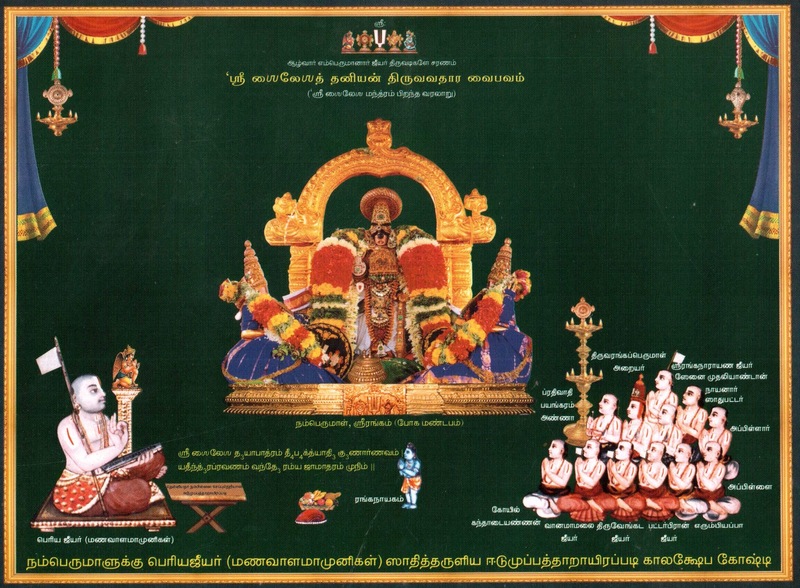 adiyen is grateful to sriya:pathi, AzhwArs and AchAryas for letting adiyen do this small kainkaryam as a samarpaNai at the lotus feet of asmadhAchAryan srImath paramamhamsa ithyAdhi vAnamAmalai pattarpirAn rAmAnuja jIyar swamy (29th pattam). Let us enjoy this divine grantham in this series of articles which beautifully explain the glories of our pUrvAchAryas in this aspect. Part 2 - http://ponnadi.blogspot.in/2013/06/anthimopaya-nishtai-2.html - AchArya vaibhavam through the words of madhurakavi AzhwAr and piLLai lOkAchAryar. Adiyen ,after performing prappati ,if one commits bhagwata / acharya /bhagwad apcharam and doesn’t repent ,does his prappati gets cancelled . ?Or he gets punished brutally but his prappati remains intact and he attains lotus feet after experiencing punishment for bhagwata /acharya / Bhagwad apcharam? Adiyen my another question is I read in kaliyug sins done in mind are pardoned ,if apcharam has been done in mind is it pardoned by lord ?Adiyen my last question is if one has done apcharam to nitya sooris like sri ,Sesha etc mentally ,can we mentally ask these Nitya sooris for forgiveness ?Do they forgive mental apcharams done to them in kaliyug ? * If one sincerely atones, begs for forgiveness and does not repeat the apachAram, he is generally fo4given. * If one remains prideful and does not beg for forgiveness or keeps repeating the mistake, one should go through the result of it. Depending on the type of the apachAram, the result may be endured within this life time or extends to the next ones. * If we commit offenses against bhagavAn, nithyasUris or mukthAthmAs - our sincere apology can be done within our heart and also by words. They will be able to understand. For others in this world, we need to go to them and explicitly ask for forgiveness. * regarding apachArams done in mind, its better to avoid that too - since it is explained as cruel as well. Jai Sriman Narayana Adiyen in srivachan bhushanam I read a story in which it’s said that bhagwata /acharya /bhagwad /asahay apcharams done by mind is pardoned.It was something like one sri Vaishnav falls on feet of learned sri Vaishnav and says that being born in this body it’s impossible to not to commit apacharams then the acharya replies that apcharams (all kinds ) done by mind is forgiving the instant one feels guilty about it and at the end he has asked to abstain from bhagwata /acharya /asahay/Bhagwad apcharam strictly from body and speech .Body and speech should be in strict control and mind apcharams are forgiven by repent in mind.